Pakistan’s flourishing drama industry is touching on a lot of stereotypical and taboo topics lately, proving that it is making strides in the right direction. We have produced dramas such as Kankar, Udaari, Zindagi Gulzar Hai, Khaani and Baaghi to give centre stage to issues that remain hidden behind closed doors. However, stories depicting traditional joint family system were missing from our TV screens for quite some time. Writer Faiza Iftekhar noticed this fact and tried to fill the void by scripting the drama serial Aangan. Though Aangan is just an ordinary story of a traditional joint family, but the way it is portrayed is what gives it an edge over other dramas. Directed by Qasim Ali Mureed, the drama has a big star-studded cast with the likes of Samina Ahmed and Qavi Khan, renowned for their stellar performances when it comes to TV. It also features Mansha Pasha, Iffat Rahim, Uzma Hassan, Hassan Ahmed, Waseem Abbas and Irsa Ghazal in lead roles, each of whom have delivered the best of their performances respectively. The plot revolves around a joint family which comprises of several family members including dada (Mian jee), daadi, four chachas (paternal uncles) and chachis (paternal uncles’ wives), two phuppos (paternal aunts), their husbands and quite a lot of grandchildren. Residing under one roof, the family lives together, eats together and sits together to make mutual decisions to the extent of deciding names of their newborns. A combination of brilliant scripting and amazing direction, Aangan depicts daily life struggles of families living in a joint setup. From the moments of their happiness to their fights over petty issues, to their interference in each other’s lives, to the moments of tension and stress, all have been well-directed. The best part about the story is that there is no lead character in particular and all the characters have been given their due time on screen to reflect their true essence. 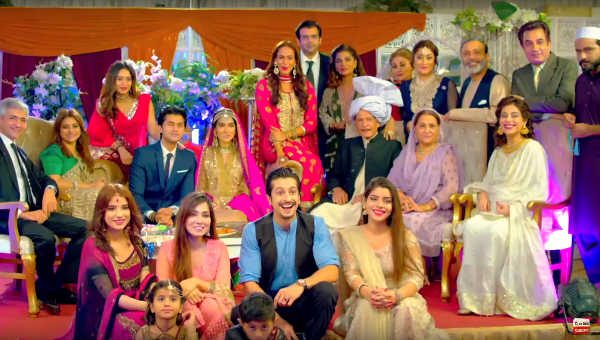 This serial truly depicts how relationships are finely knit together in Pakistani joint families and reflects the true dynamics of joint family system. There are brawls, clashes and arguments among the family members, yet they are connected with an invisible string of love and affection that keeps them united. Whether we live in a joint family or a nuclear one, we can all relate to it somehow or the other. You might relate to the always complaining nand (younger sister-in-law) who comes to your house unannounced or the pacifying jethani (older sister-in-law) who tries to calm down conflicts, or the irritating dewar (brother-in-law) who relates everything to religion. Aangan depicts how beauty of relationships lies in diversity of opinions. There are multiple characters in the drama similar to multiple members in a joint family, and each of them has his/her own thought patterns and opinions, which leads to conflicts and clashes at times and happiness and unity at others. From the maulvi chachu to the modern chachi, to the fussy phuppo, to the dominating dada jee, Aangan has displayed all the characters in a family with the right amount of humour and emotions. Aangan sheds light on how customs, practices and values of a family change over time and how there is nothing wrong with that. It should be appreciated rather than negated and created a fuss over. It shows how the head of the family, dada jee, realises the mistakes he has committed and does not want his sons to do the same. For instance, dada jee did not allow his daughters (Anila phuppo and Zoya phuppo) to study beyond intermediate, yet he supports his great granddaughter (Shahina) in her wish to pursue her education in the field (crime reporting) that interests her, despite her own mother being against it. Instead of the melodramatic and repetitive storylines of our dramas, the writer has penned down a script that is fresh and entertaining, yet highlights several serious issues faced by our society that need to be addressed. Discrimination between a female child and a male child, preventing girls from pursuing higher education and careers, interfamily marriages, lack of family planning awareness and plight of childless couples, are some of the many issues that Aangan addresses. What makes it different from other dramas is that instead of just drawing attention to the issues, we also get to see real time solutions to these problems. With the right amount of suspense and humour, every episode of Aangan leaves us pondering over the next. When things start getting serious in the family and you are totally engrossed in the play, the director would entertain us with a good amount of laughter via unfiltered dialogues of the characters. As soon as an episode ends, you are left craving for more and watching the teaser of the next episode becomes a must. For instance, we could predict that one of the chachas has hidden his second wife from the family, yet we could not ascertain who that chacha was. The director kept us in apprehension for at least two episodes until the secret was finely unveiled. Just to add on to the hype, let me mention here that my husband, who actually hates watching Pakistani dramas, not only watches Aangan with keen interest but also waits for the upcoming episodes anxiously. Even on social media groups, people are discussing this drama and making predictions about upcoming episodes which shows Pakistanis are actually finding it interesting. Even after 28 episodes, this family saga of Mian jee’s house has not lost its charm and keeps us all glued to the screens till the very end of it. 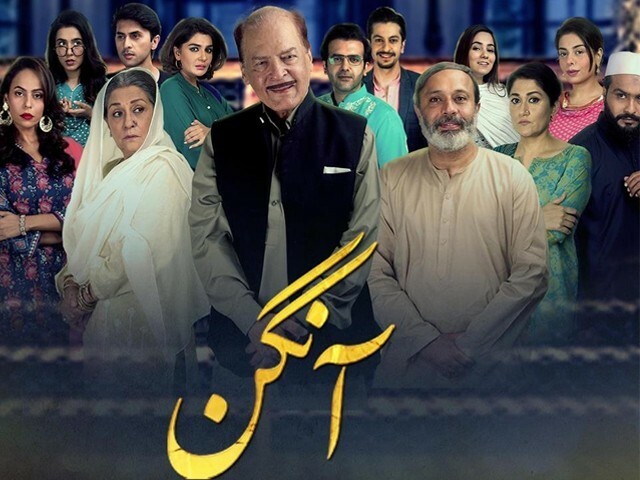 In a nutshell, Aangan is the right TV show for you, if you wish to watch something with your family that truly relaxes you and makes you laugh after a long and tiring day and has actually got something to deliver.